Do you need a travel agent specializing in Disney destinations? 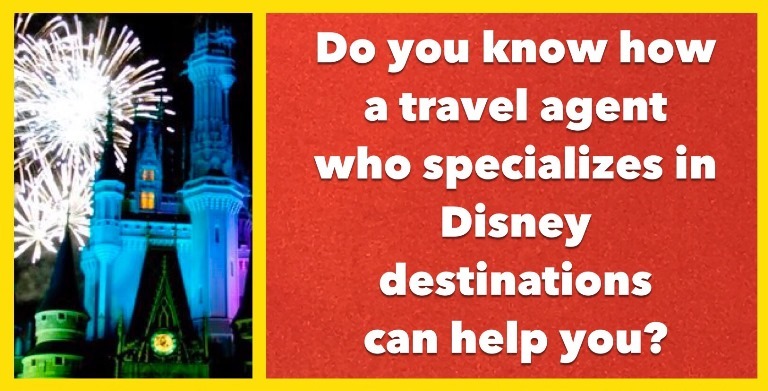 The types of people who benefit most from having the help of a travel agent that specializes in Disney destinations like Disney World, Disneyland, Disney Cruise line and Adventures by Disney. For every person who loves researching and planning trips, there is at least one busy person who just doesn't have time to wade through mountains of information and appreciates a disney-focused agent who eats, sleeps & breathes this stuff. For one thing, you don't know what you don't know and first time or infrequent visitors to Disney World find it helpful to have an agent that walks them through the vacation planning process. Not only that, but there is a lot of old and just plain wrong information out there - we focus on the Disney destinations so that you get accurate, up-to-date information. Hotels and building location requests - Picking a hotel that is a good fit for your needs is just the beginning of what your travel agent can do for you. Most people don't add building location requests to their reservations and we do it for every client. (not guaranteed, though Disney does try). Guests don't always realize that a few Disney hotels don't have elevators which is fine for a lot of people but becomes very difficult if someone in your party has mobility issues or if your drying to carry a sleeping child or stroller up the stairs. We also watch for discounts and promotions and automatically apply the best available offer to your qualifying reservation. Dining Reservations - people sometimes don't realize the sheer size of Disney World and they'll book dining that has them wasting a lot of travel time or scheduled at times that cause them to miss parades or other priorities - we watch for red flags like that. Not everyone plans a trip six months or more in advance, which is when you can start booking Disney Dining reservations, and they have trouble getting good reservations for their trip. We can help with offering good alternatives and watching for cancellations. All FastPass+ options are not created equal - for example, not everyone realizes that having a Seven Dwarfs Mine Train or Toy Story Midway Mania FastPass+ reservation is more helpful than any others in those parks and that certain FastPass+ options don't really bring any benefit to the table. We can help guide you through these challenges. The least expensive option is two standard rooms at any Disney World value resort. You would have a total of 4 double beds and 2 bathrooms. You can also get connecting rooms at several of the Disney World moderate or deluxe resorts but some of the other options we've listed below may be cheaper. In the case of a family with 2 adults and 4 children age 17 or under, you can get guaranteed connecting rooms with an interior door between them. A party with three or more adults can request connecting rooms but they won't be guaranteed connecting rooms though it is worth noting that Disney does have a fair number of connecting rooms and will try to accommodate the request when possible. If you only need three beds, it may be possible to get a room with a king bed that connects two a room with two double beds at the value resorts or two queen-size beds at the moderate and deluxe resorts. A standard room with two double beds at one of the Walt Disney World Resort value hotels. Rooms with one king bed and connecting rooms may also be available. The Family Suites at Disney’s All-Star Music (ASMu) or Disney’s Art of Animation (AoA) can accommodate six. Disney's All-Star Music Resort is generally less expensive than Disney's Art of Animation resort and has 1 queen bed, 1 double sleeper sofa and 2 twin sized pull-outs, along with a kitchenette and 2 full bathrooms. Disney's Art of Animation costs a bit more but is newer and has 1 queen bed, one double sleeper sofa, and 1 murphey-type table bed, as well as a kitchenette and 2 full bathroom. The family suites at Disney's Art of Animation resort can sleep up to six adults plus one baby in a crib. The Cabins at Disney’s Fort Wilderness Campground sleep six. They have a bedroom with a queen bed and a twin size bunk bed, there is also a murphy bed in the living area. This option only have 1 bathroom but it does have a kitchen with a refrigerator, dishwasher, convection/microwave oven, and two counter top burners. People either love or hate the cabins – I love them! The challenge with the campground is that it is so large and there is an internal bus system so you have to catch a bus that takes you to either the boat to Magic Kingdom or the buses to the other parks, adding additional transportation time. The bedroom in the cabins at Disney's Fort Wilderness Resort & Campground can sleep up to four guests; two more can sleep on the Murphy bed in the main living area for a total of six adults + up to one baby in a crib. The two- and three-bedroom villas at the Deluxe resorts are very nice, have full bathrooms, full kitchens, free laundry, in a wonderful resort setting with lots of great amenities. The exact bed configuration may vary by unit size and resort. Keep in mind that 3-bedroom units are excluded from almost every Disney sales promotion and some of the other villas are also often excluded from discounts. Some of the Disney World deluxe resorts have a limited number of specialty rooms or suites that can accommodate six adults (+ one baby in a crib) but these can be very expensive and have very limited availability. Suites and deluxe rooms are also often excluded from discounts and promotions. Disney's Animal Kingdom Lodge has a couple of 1-bedroom suites that can sleep up to six (6) adults. Disney's Beach Club Resort does has some 2-bedroom suites - Club Level that can accommodate up to seven guests. Disney's Boardwalk Resort has Club level - Deluxe rooms that can accommodate up to six adults. Disney's Wilderness Lodge has Club level - Deluxe rooms that can accommodate up to six adults. DoubleTree Suites by Hilton - Orlando - Disney Springs has spacious and comfortable suites that can accommodate up to six guests or seven, if the group includes an infant in a crib. These suites feature two (2) queen beds in the bedroom and a sofa sleeper in the living room. This Disney Springs Good Neighbor hotel offers great exclusive Disney benefits like Extra Magic Hours, Early FastPass+ booking privileges, and complimentary transportation to the Disney World theme parks but it does not participate in Disney Magical Express airport transportation. Click here for more information. How Universal’s Endless Summer Resort - Surfside Inn Family Suites compare to the family suites at the Disney World value resorts. 2018 Free Disney Vacation Planning Video - Every year Disney creates a vacation planning video that you can view online. Just click the image below to request your free copy. It is a fun way to tell the kids about your Disney vacation plans. This free video provides some great basic information about the Disney World and Disneyland theme parks and resorts but won't help you plan an itinerary that puts you in the best theme park for each day of the trip but don't worry - we'll help you with that when you book your Disney vacation through Build A Better Mouse Trip. The online version is available in both English and Spanish. If the banner above doesn't work, you can click here to view. This is a sponsored post. Build A Better Mouse Trip receives a commission on each person who views the free video available through the ad in this article. In anticipation of holiday crowds, Disney is opening an hour earlier at some or all of their parks to the general public. This is not an “Extra Magic Hour”, this is for everyone whether they stay at a Disney World hotel or not. The Magic Kingdom will have morning “Extra Magic Hour” most days too. On a scale of 1 – 10, the crowds will be mostly 9’s or 10’s during these dates. Early birds get the most rides: The first 1 – 2 hours of the day are always the least crowded. Arrive at least 30 minutes before 8AM park opening to enjoy the shortest lines of the day. Please, please please use a touring plan: Use the plans from the Unofficial Guide to Disney World (printed guidebook) or get a subscription to TouringPlans.com – these crowd levels are where a good touring plan provides the biggest benefit so please use those plans. Contact me if you don’t know where to find the plans or have questions about how they work. I’m happy to help. Option 1: "I hate all of this ?#&%! Technology!" Service - This service is for people that find it just infuriating that Disney now wants you to set up a "My Disney Experience" account, book dining and FastPass+ online, customize Magic Bands, and download an app. It can be so frustrating, especially if you don't have a teenager handy to do it for you. Book your Disney vacation through us and our agents will happily do almost all of it for you and they'll walk you through anything you absolutely have to do on your own. We even offer the Unofficial Guide to Disney World - a printed guidebook - as a thank you gift option to help with your plans. We still send printed documents and printed copies of the theme park touring plans to you via the U.S. Postal Service and we're happy to discuss your plans and needs over the phone. Option 2: "I'm Too Busy for All This Advance Planning" Service - Doesn't Disney realize that the kinds of people who go to Disney World have jobs and families? Do they seriously expect you to research resorts, plan every dining reservation six months in advance, research the best FastPass+ options and then book them at midnight exactly 45 days prior to arrival? Who has time for that?!? If you feel this way, you will definitely want to utilize the services of our agents who eat, sleep and breathe this stuff and can do most of it for you. We can help narrow the choices down to those that are a good fit for you and can book dining and FastPass+ on your behalf. Do you mill your own flour or sew all your own clothes? Of course not, and there is no good reason not to let us do the leg work for you, especially since our services are free when you book your trip through us. We'll have everything ready to go when your vacation rolls around. Option 3: "Help! I'm Trying To Plan Everything For My Extended Family" Service - Group trips can be a wonderful and memorable experience but they do present some very real vacation planning challenges as you try to juggle different ages and different vacation styles. Having a travel agent that specializes in Disney destinations is a huge help in this situation because we really do know the resorts, restaurants, and theme parks very well and we can help you create plans that include everyone's priorities and that address everyone's needs. Option 4: "I've Already Booked My Trip but Now I'm Overwhelmed!" Service - It is true that our services are completely free when you book your Disney vacation through us but we may still be able to help if you booked your trip yourself. 1) If you booked through Disney less than 30 days ago and have not paid your trip off in full, we can probably still be added as the agent of record on your existing reservation and you'll get all the benefits we offer just as if you'd booked with us in the first place. (2) If that isn't possible, we can look at your needs and let you know the fee for helping with reservations and itineraries. We can also offer "My Wife Told Me to Plan This Thing" services, "I need a Disney Buddy who is as excited as I am" services, and services for people with allergies or any number of special situations. Just tell us what you need and we'll let you know how we can help. Build A Better Mouse Trip brings a lot of experience and expertise to your trip. Our agents will help you select the right resort for your budget, plan a great "Best Days" itinerary, help with all your restaurant questions and FASTPASS+ reservations, and provide fantastic theme park touring plans that will keep you ahead of the crowds and out of the long lines. Our services can help you whether you are driving or flying. We book directly through Disney and Universal and we do not charge a fee or service charge of any kind which means that you get every available benefit without paying extra. One travel agent who really knows Disney World & Universal Orlando and who gets to know you and includes your priorities in every step of the trip planning process. Expert answers and honest opinions to help you with resort, activity and restaurant selections. We'll book dining reservations on your behalf - subject to availability. We'll give you excellent Disney and Universal theme park touring plans that keep you ahead of the crowds and out of the long lines. Click here to read more about touring plans. Request a quote today – we use the same quote request form for Disney World or Universal Orlando. Just skip any stuff that doesn’t apply and one of our agents will be in touch with you soon to help you plan your next adventure. This isn’t a commitment, it is just the easiest way to get the conversation started. There's never any pressure and we're always happy to answer your questions.